Height: no idea, but I do know that he is longer! His 12 month footies we just bought him are already too tight! I would guess about 29in. 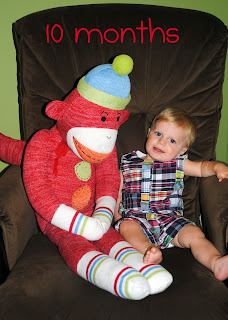 Clothes: a few 9 month outfits still fit but we are transitioning into all 12 month clothes! One big thing that happened over the last month is that Grayson is now completely off of baby food! He is such a big boy and is only eating table food. It has been a struggle to get him to try new foods, but I just have to keep reminding myself that he won't always just want a grilled cheese sandwich! Here are a few of his favorite foods: grilled cheese (I am now adding some chicken/turkey to these), hot dogs, chicken nuggets--the MorningStar fake-out nuggets are great!, goldfish, baby mum mums, peaches, nectarines, grapes, cinnamon raisin toast, ravioli, and those new fig newton crackers. Grayson still has 4 teeth on top and 2 on the bottom, however, he is currently working on some bottom molars! It's hard to believe that G has been a crawler for 2 months now. He moves at lightning speed! Seriously. I put him down & 2 seconds later he will be dumping out the dog bowl or pulling a wallflower out of a socket (mama of the year award, right?!). Grayson is still pulling up on everything. In the past week, he has actually taken a few steps by himself!! He took 5 steps last Thursday trying to get to Jack--typical; and, he took about 3 steps by himself this weekend at our reunion! We are doing a lot of practice with this whole walking business. I think he will take off before his 11 month birthday! :) ...and it won't be to get to his mama, it will be to chase his 3 dogs! we are learning to eat off of a plate -- messy, messy, messy..
fall asleep on his own instead of being rocked...big change for this mama! He will only cry for a minute or so & then lay down and fall asleep. Some of Grayson's favorite things at 10 months are: his sippy cup, a little red bird toy that we call "Tweet Tweet," standing in the baby pool and playing with toys, walking all over the hardwoods in his walker, Baby Beethoven--this saves us on longer car trips!, his 2 push toys--the firetruck & car, going down the slide, eating whole peaches & nectarines, and making funny faces & getting people to copy them. Grayson is finally showing more interest in his books which makes me so happy! I have incorporated this into our new bedtime routine and I love sitting with him and reading books. I hope he loves to read! His favorite books right now are his Peek-A-Boo books. Grayson's personality is so much fun! He has started making funny grunting noises and loves it when people copy him. Ben and G will go back and forth making noises with each other & G just laughs and laughs! Grayson is so talkative lately. I really wish I knew what he was saying! After we do something fun, he just babbles away....like he is telling me all about what just happened! Grayson finished his first music class this month with his cute friend Ruby. They both loved it! He is a social butterfly & I think I want to enroll him in a Gymboree class for the fall. I'm sure he would love spending more time with other babies his age! This is what happened at the end of our photoshoot. Meltdown. No more pictures, mama!! I can't believe that 10 months has passed since this sweet little boy came into this world. I can't believe that I am already starting to plan his 1st birthday! I say it every month, but time is just flying by. This stage is so fun. I am soaking it all up because I know that toddlerhood is quickly approaching! Happy 10 months, little G! ok, so he is flippin' adorable!!! AND I need to know how you got him off baby food... i am terrified to give cham cham "real" food because i'm scared she will choke! did you have this fear or did you just go for it? what food do you suggest starting with? i give her small bites of things like bread and fruits- but never let her eat it on her own! yikes!!! help a girl out! Happy birthday little G! You are adorable as ever! I love llama llama!! Mad at Momma is a favorite! Grayson is so cute! You are too funny... love the day in a nutshell post. Hope he is feeling better! Oh and the hair the great. :) Nothing like an impulsive haircut to lift the spirits! Have a great weekend!